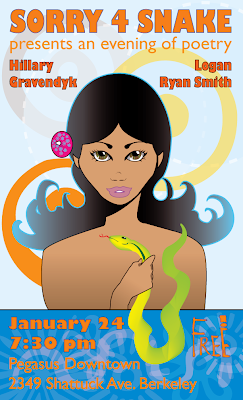 Hillary Gravendyk and Logan Ryan Smith are reading on the 24th of January to celebrate the second issue Sorry for Snake at Pegasus Downtown. Tiki images are fun to think about in the winter. In Polynesia, they are not too cold to go to a poetry reading, so maybe you won't be either. I enjoy the colors of Tiki designs. Also, there is often a dark element to Tiki stuff, which is why I wanted to have a girl holding a snake in a tropical paradise setting. And who doesn't love a girl with a cocktail umbrella in her hair?